A firsthand look at the toothy grin of a tiger shark is nothing to take lightly. This is especially true when your view is through a foggy mask, deep beneath the surface of the water. Are you brave enough to swim with these massive fish? Though given a bad reputation, tiger sharks are usually quite docile creatures. These majestic fish are excellent hunters, and often work together in large schools. Groups on the prowl are known to be able to take down prey as large as whales. Humans are rarely on their repertoire, however. Though tiger sharks occasionally tangle with snorkelers and divers, unprovoked, it is usually a case of mistaken identity. Follow your Divemaster’s instructions, maintain a safe distance, and then just sit back and enjoy the show. 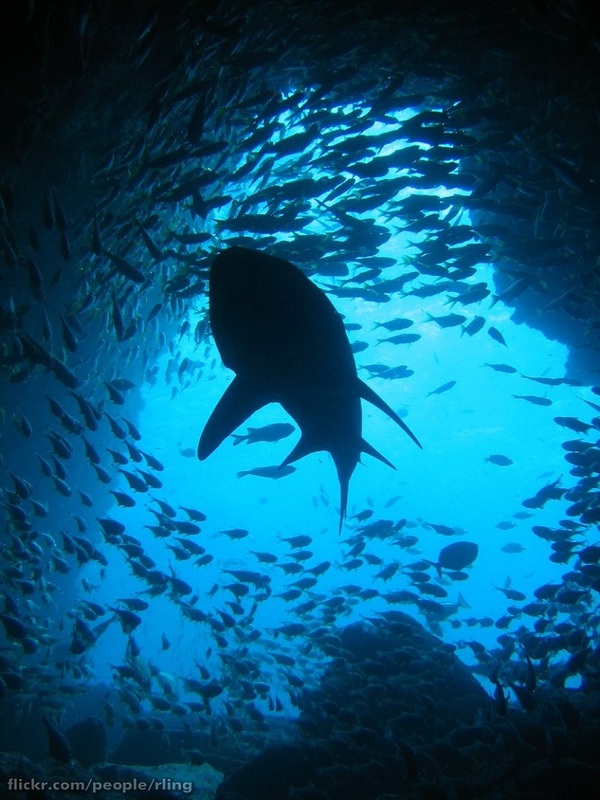 While shark diving is inherently dangerous, there is no need to shy away from this incredible opportunity. If it makes you feel more secure, it might be best to brush up on your first aid and shark biology before taking the plunge. Perhaps the most surprising place where you can dive with Tiger Sharks is in North Carolina. The dive operators here do not feed or chum the waters, giving visitors an authentic look at tiger sharks in their natural environment. Though summer and fall are the most comfortable months because of warmer waters, tiger sharks can be found here throughout the year. The sharks prefer a secure environment, so many of the shipwrecks in the area make excellent homes for these placid sharks. The wrecks that are most popular with tiger sharks are the Atlas, the Aeolus, and the Spar, among several others. 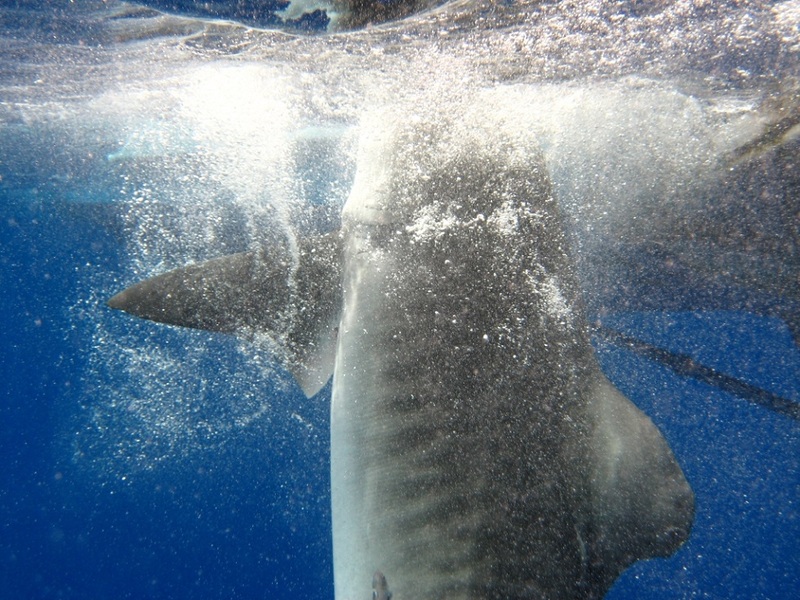 Dive with tiger sharks in Hawaii, especially around the capital city of Honolulu on Oahu. Your best chance to get an up close view of these incredible sharks is during the fall when they come in droves. There are cage dives available where you can get as close as possible to the sharks that swim below and beside your cage. Many tiger sharks come right up to the boat, making for some pretty impressive photo ops. If you aren’t interested in getting into the water with these intimidating animals you are more than welcome to watch them from the boat. The glistening dorsal fin and the occasional flash of teeth might be all you need to satiate your curiosity. Go on a baited shark dive along the Protea Banks in South Africa. The best time to find the impressively large tiger sharks that roam these waters are from March to June. In South Africa you can go on a cageless dive with tiger sharks that casually reach a length of 13 ft (4 m) long. The Divemasters here use a naturally inspired baiting technique to lure these extraordinary fish to your location. Divers drift together with the bait through the current, cruising alongside the tiger sharks. Often, the sharks will swim right up to the divers, casually brushing past them as they make their way through the crystal clear blue water. Fiji is an exquisite hideaway for many of the world’s sharks. Established in 2004, the Shark Reef Marine Reserve offers a protective habitat for the underwater ecosystems between small Beqa Island and Viti Levu, Fiji’s largest island. Reef sharks, silvertips, nurse sharks, bull sharks, and lemon sharks can all be found here, in addition to the impressive tiger shark. During a shark dive here you have a chance of seeing any and all of these mesmerizing species, as well as the abundance of marine life that flocks to the pristine coral reefs. The diving in Fiji is some of the best in the world, offering warm water and incredible visibility year round. Sharks reside here throughout the year, making any time a great time to embark on your adventure. It is generally concluded that Tiger Beach in the Bahamas offers the world’s best tiger shark dives. During your visit to Tiger Beach you can expect to see Tiger sharks, Lemon sharks, Reef sharks and Nurse sharks. The best times to spot these epic animals is during early April, when the sharks are at their most active. Many dive operators offer tours in this area, so take advantage of the excellent deals available. Some charters have liveaboard options, for the adventurous, and have all inclusive meal and drink options.